My Dishwasher Is Noisy During The Drain Cycle. I start a wash cycle on my dishwasher and when it is time to drain the water out, it makes a loud noise. My usually very quiet dishwasher goes through the wash cycle, drains out the water, and now it constantly makes noise. The noise sounds like a loud rubbing, humming, or grinding sound. This happens no matter what setting I have my dishwasher set on. If I run a quick wash or a long wash with heat, it still makes the noise when it comes time to drain out the water. My Samsung dishwasher is 3 years old and the noise has just started in the last month. What would cause the dishwasher to make this noise ONLY when it drains out the water? FYI: The water does drain out of the dishwasher, however the noise is always present. The main part in your dishwasher that will cause this noise when it drains out the water is the DRAIN PUMP itself. NOTE: It may be a faulty DRAIN PUMP or there might be something stuck inside the SUMP ASSEMBLY which is creating the noise you hear when the dishwasher drains. – Remove power to the dishwasher. – Open the dishwasher door and remove the racks. – Locate and remove the bottom spray arm. – Locate and remove the filter screen. – Locate and remove the sump cover. – Visually check around the drain pump for any object that could be causing the noise. – If you find any objects down near the drain pump, remove them and clean out the area. – If no objects are found near or around the drain pump, remove the drain pump from the sump assembly. – Visually check to see if there is anything stuck inside or jamming the drain pump that could be causing the noise. – Locate and remove any debris or objects that may be inside the drain pump. 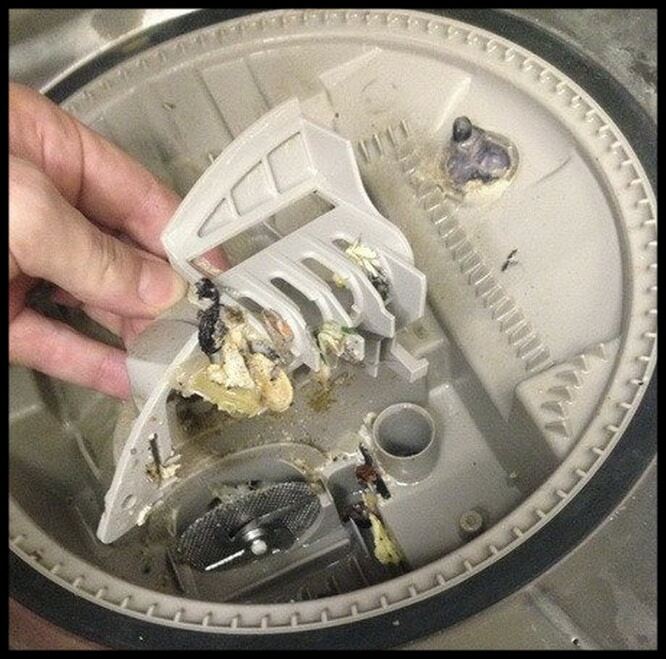 – If the drain pump was clogged and is now free of debris and not clogged or jammed, put it back into the dishwasher. – Put everything back together and run a quick test wash.
– If the drain pump and the surrounding area is free of debris but still making noise – REPLACE THE DRAIN PUMP. 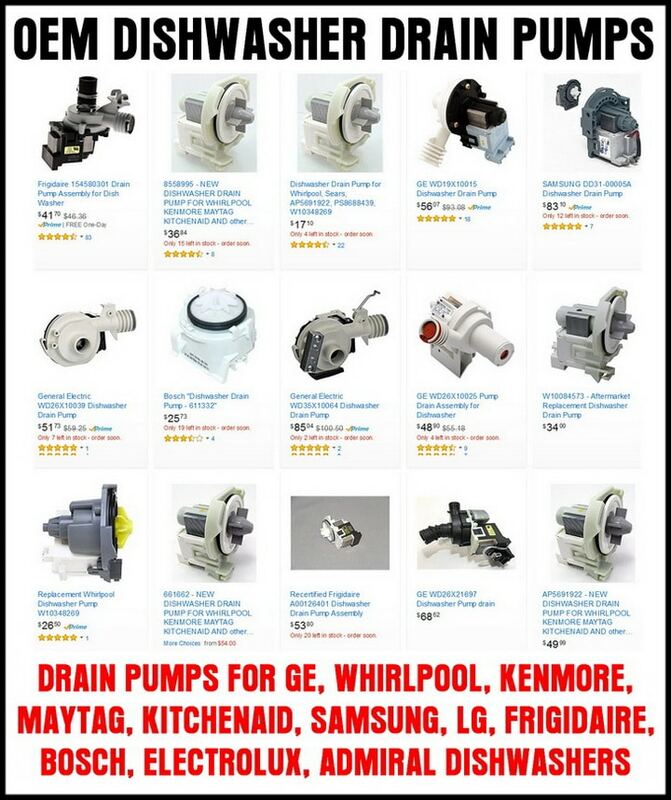 Dishwasher Drain Pump – What Does it Do? The purpose of the drain pump is to supply water pressure into the spray arms and to drain the water out of the dishwasher. Where Is The Dishwasher Drain Pump Located? 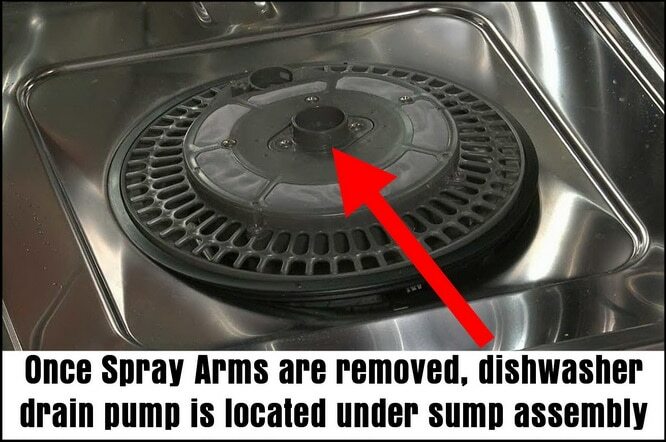 The dishwasher drain pump is attached at the bottom of the dishwasher and can be located by using the steps above. 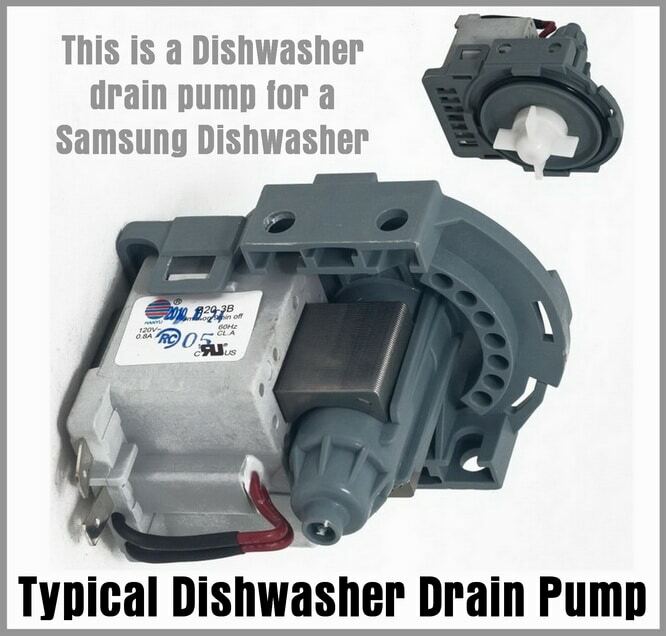 Dishwasher Drain Pump – How Does it Work? The dishwasher drain pump has two separate compartments for 2 different operations. The first one is for washing or supplying water to the spray arms to wash the dishes. The second part of the dishwasher drain pump is to drain the water from the dishwasher at a specific time. – The circulation part of the dishwasher pump has the wash impeller and the filtering components. – The dishwasher drain portion has a drain impeller and chopper blade. – On certain dishwasher drain pumps, it is operated by a solenoid diverter. – The impellers in the pump spin using a motor which is electric and is attached to the pump. Dishwasher Not Draining and Noisy? Have questions about dishwasher making noise during the drain cycle? Please leave your questions below and we will be happy to assist you in fixing and repairing your dishwasher. I have a Bosch silence plus 50 that has recently started making loud gurgling noises just as it starts to drain. It sounds like it is sucking air and water, then becomes quiet again. The pump seems to be working fine otherwise. I’m wondering if it could be a solenoid that isn’t opening/closing properly? Previous post: Can I Use An Extension Cord With A Space Heater?